DG Nalani would like to send a "Mahalo Plenty" message for the outpouring of generosity to provide household items to the homeless families that are moving in to the permanent homes at Kahauiki Village. 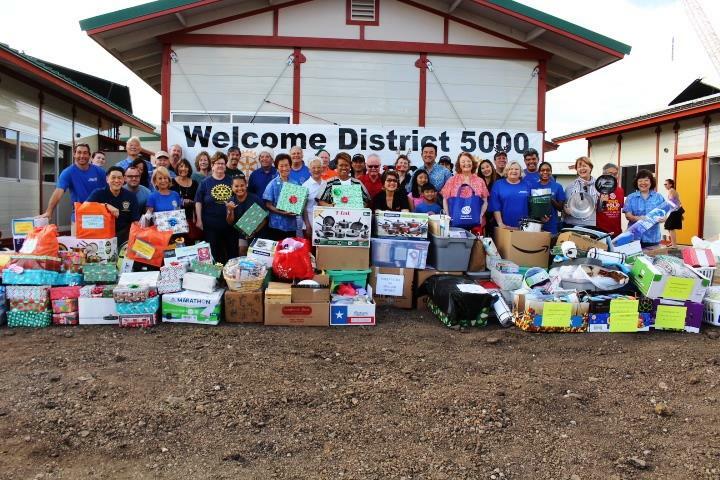 With every one of the 26 clubs on Oahu participating in this project, Rotary District 5000 is providing pots, pans, toothbrushes, hairdryers, shower curtains, baby bottles and much more to each family moving in this first phase of the project. Here is a message from the Village contractor: "Seen couple moms carrying their babies last Sunday through the site. They’re said they are very excited and couldn’t wait to move in. As they walked in (to a 1 bedroom unit), they were so happy—tears flowed. They kept saying “this is a real house” and "we’re so blessed”. They also asked me to pass this on: THANK YOU VERY, VERY MUCH----MERRY CHRISTMAS!" This is what Rotary is about...making a difference in our communities. Thank you particularly to the following clubs that provided items for more than 1 unit: Honolulu, Mililani, Honolulu Sunset, Waianae Coast, Pearl Harbor, Ala Moana, Kapolei, Honolulu Sunrise and Metro. Also to the Waikiki club for the wrapped gifts for each unit and even DG Nalani's family wanted to participate by collecting items for a unit, in lieu of giving Christmas gifts to each other. This amazing project is being put together by many, many volunteers from organizations, the military, construction workers, caring individuals, but Rotary D5000 and friends have been credited for really stepping up with manpower to paint, clean and provide a lot of the household items. Kudos to Kirk Hovious (Honolulu Club) for tirelessly coordinating the volunteer efforts to get the units ready. If you were planning to help on Wednesday to sort linen at 1pm, call Naomi at 492-0126 because someone donated boxes of sheets and the Wed delivery may not be needed. We won't know until Tuesday. Information about the project can be found at their website: kahauiki.org. If you want information about volunteering, call Kirk at 330-1339. On behalf of DG Nalani and the District Homelessness Task Force, THANK YOU to all of the Oahu Clubs and volunteers! Merry Christmas!